I feel a bit naughty about posting a cake recipe in January. 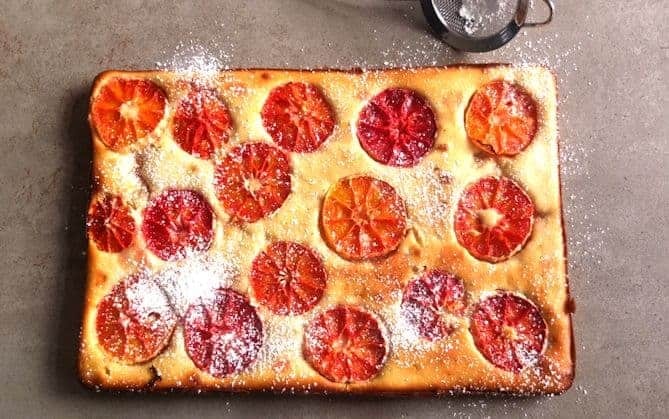 Traditionally January should all be about diet, healthy stews and superfoods that transform you from a size 14 to a size 6 but when I came across this Blood Orange Cake Recipe I could not resist. To be honest, I needed some distraction as well, because although we are not able to live relatively comfortably in our new house; there is still a lot to do, like stripping, sanding and painting the stairs. It is more work than you think, and I decided to alternate stripping the paint of the stairs with making this cake. This resulted in me munching on cake and the stairs stay as they are until next weekend! Blood Oranges are the perfect ingredient for January. Although I did not have them for years because I was not sure where to get them in the UK. It really annoys my husband that it is quite easy to find Blood Orange Juice at supermarket but it is a lot harder finding actual Blood Oranges. It was only when I went into my local Lidl and discovered that they now stock Blood Oranges that I was inspired to use them as my main ingredient for my next recipe. I never made a Blood Orange Cake before so I was looking for a simple recipe. Also as mentioned I am not very good at decorating cakes, so I needed something that does not requires too much attention to detail. I was delighted when I found this recipe which is easy to make but looks incredibly colorful and intricate. Please 2½ oranges. Slice them in about 1cm thick slices. Now cut open the vanilla pod and scrape out it's essence. In a bowl add the eggs, sugar, butter, buttermilk, vanilla essence, orange flavoring and a pinch of salt, and mix in to a smooth paste. Now mix the flour and baking powder and sieve onto the egg mixture, and mix in well. Now pour the mixture onto a greased baking tray (about 30 cm x 40 cm in size), and place the orange slices on top. Place the tray into the preheated oven (about 180 degrees Celsius) and bake for about 20-30 minutes. Juice the leftover half orange, and once the cake comes out of the oven just drizzle it with a teaspoon over the hot cake. After allowing the cake to cool, cut into slices and sprinkle with icing sugar before serving. 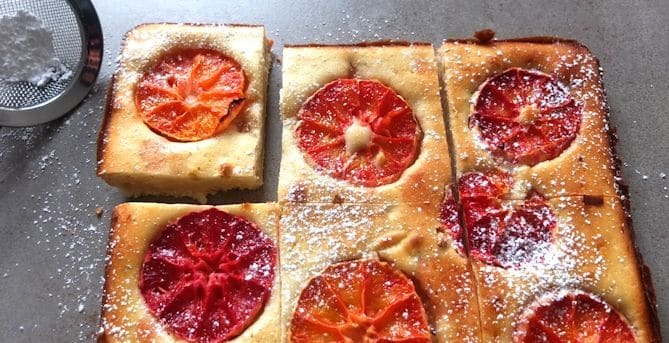 9 Responses to "Easy Blood Orange Cake Recipe"
This looks delicious Marita! I can usually find blood oranges here in Canada, but lately haven’t had much luck. I’d like to try this recipe soon if I can find any. It was delicious thanks. I know I love blood oranges too. Now that I know where to buy them I will use them more. Thanks! I hope you enjoy the cake!